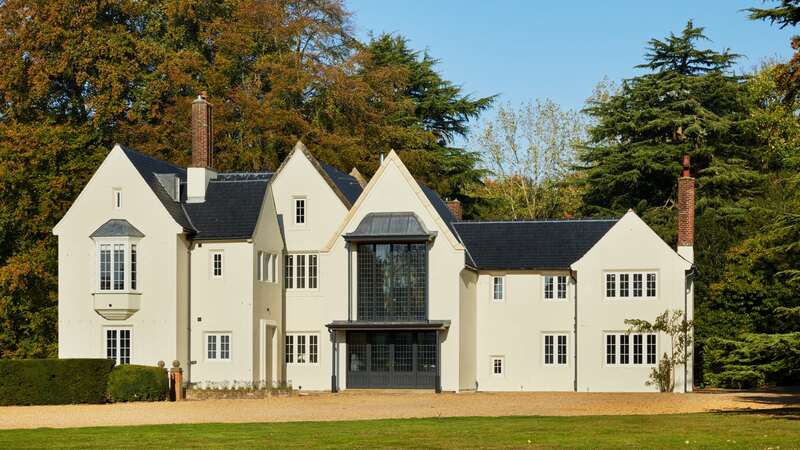 This is a home renovation of unrivalled style and quality, with finely crafted replacement windows, new doors and a sensational floor-to-ceiling glazed entrance hall. The owners were a returning Westbury client, who had a pool house and garden room in their previous home from our sister company, Westbury Garden Rooms. They purchased a derelict property that had been empty for some time and was in need of a complete refurbishment, including all of the windows and doors. They were keen to make their own mark on the property and transform it into a grand and beautiful home. Taking a collaborative approach, we discussed the client’s requirements and understood that while they wanted their home to make an impact, it was important to them to keep a sense of the original style. Overall, we replaced the windows in the same style and design as the originals, which had a lead design rather than glazing bars. 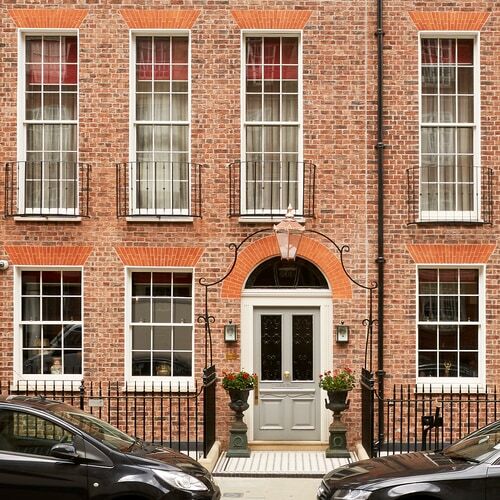 Most of the windows throughout the first floor of the property were legacy box sash windows. 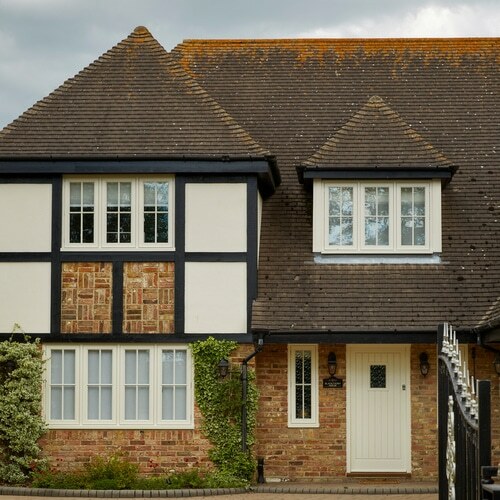 To the left-hand side of the property, we fitted beautiful fully-opening French casement windows into two first floor bays. 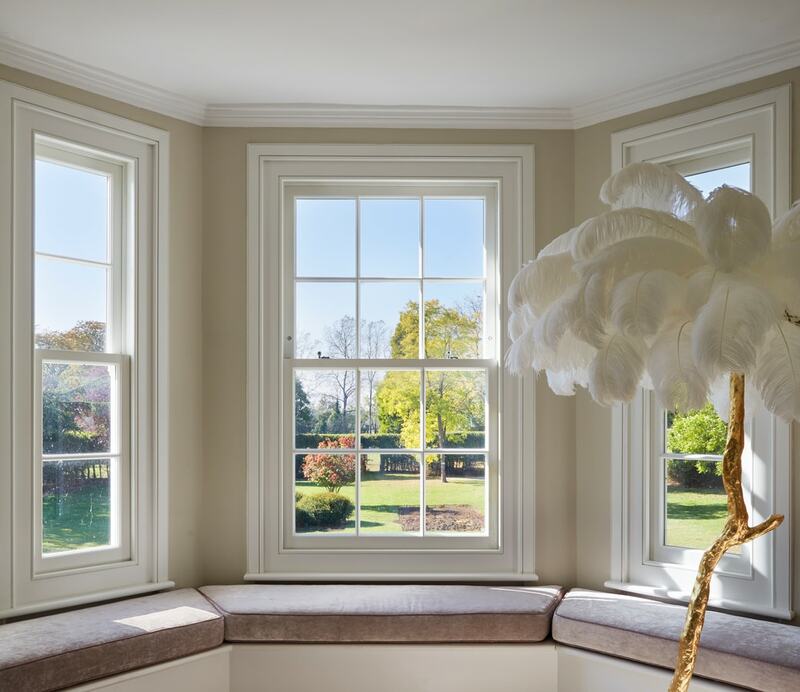 Directly under these on the ground floor, we fitted a rather unique French casement window with a lower decorative bolection panel. While they look like doors, they don’t have door handles and they open like a window. 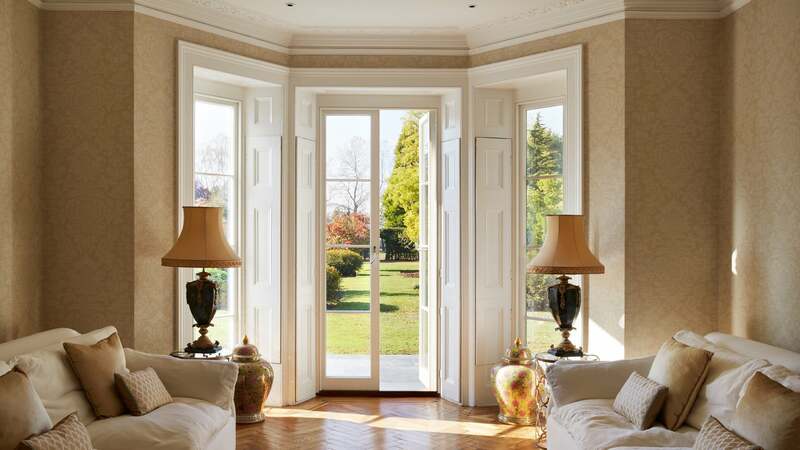 This is a very traditional style that you don’t normally come across, but these types of ground floor windows were once a common design before French doors evolved from the style. 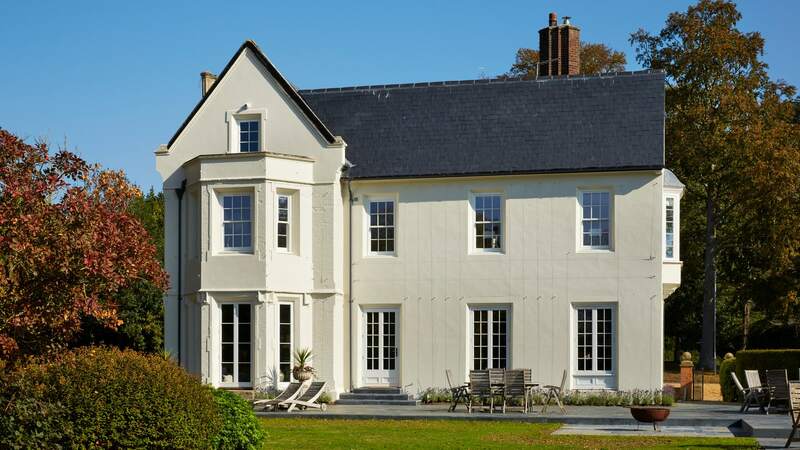 While most of the joinery was painted in Westbury White, the clients decided that the joinery at the back of the property would be painted in a dark Westbury Grey. They wanted this area of their home to feel like a more modern part of the building, as it included a new kitchen and boot room renovation. 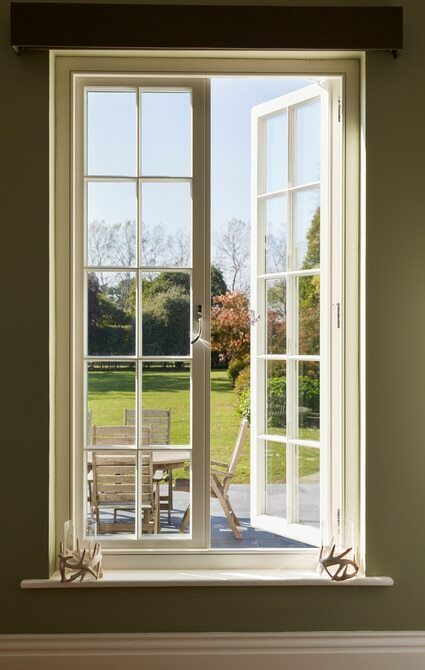 To continue the theme, French casement windows were fitted on the ground floor. 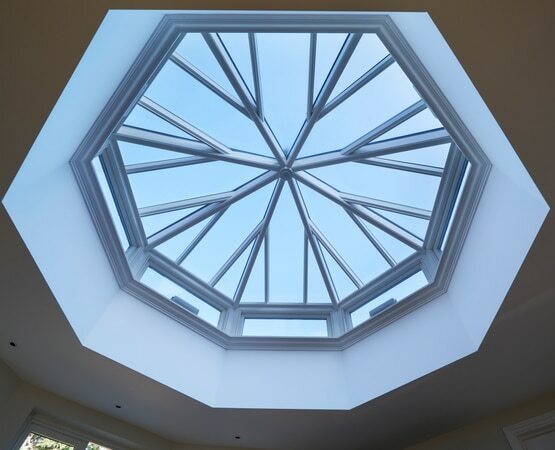 We designed a perfectly balanced octagonal roof lantern with electrically operated ventilation vents with automatic control. 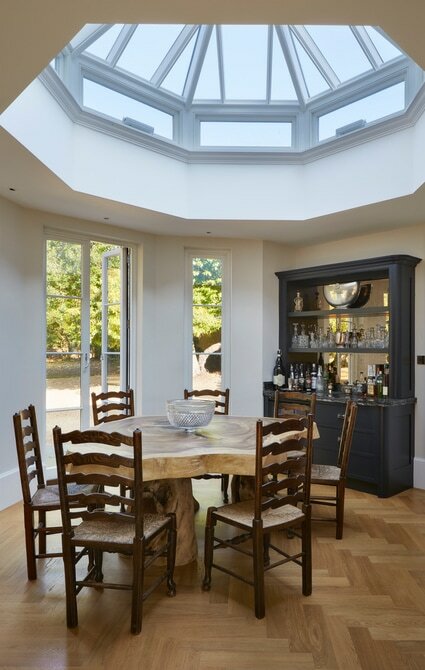 They wanted to flood the rather gloomy dining room with more natural light and make the ceiling feel higher, so a new opening was formed to create the lantern. 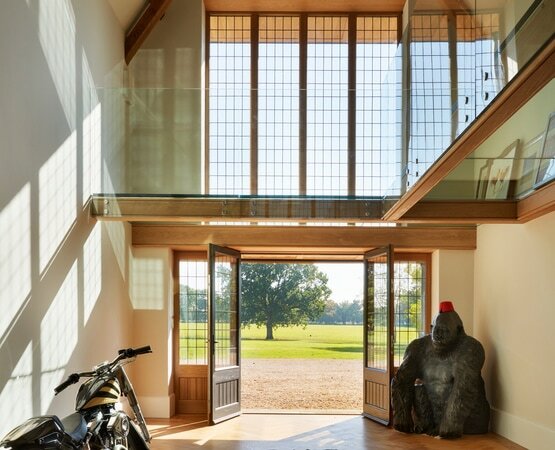 Most impressively, a grand two storey main entrance glazed screen was installed to create a dramatic and unique front of house. The screen was manufactured in engineered, sustainably sourced oak, painted in Westbury Black with oak stained interiors to match the floor. Double doors on the ground floor were crafted with engineered v-grooved vertically boarded panels. The concept for the main entrance was all about grandeur and designing something that visually captivated people’s attention. In order to maximise on the light that would stream into the hall and ensure a larger sight line from the inside, we directly glazed the individual panels on site, making more glazing visible. 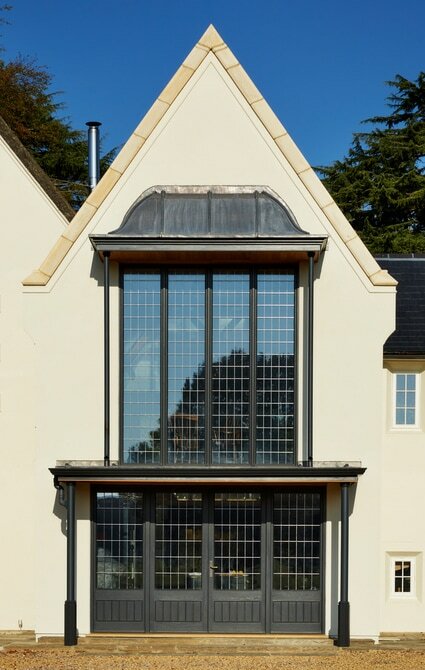 We used antique led in the glazing, to ensure the dark-coloured detailing won’t fade.